Febrile seizures are a relatively common childhood condition, referring to a child having a seizure when they have a high temperature most usually as a result of an infection. Although febrile seizures may be very frightening, most are harmless and do not pose a direct threat to a child’s health. Most children have what is known as a tonic clonic seizure. 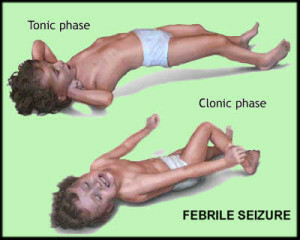 During a tonic clonic seizure, the child’s body becomes stiff, they lose consciousness and their arms and legs twitch. Some children may also wet themselves. Febrile seizures are quite common with an estimated 1 in 20 children having at least one febrile seizure at some point. Most febrile seizures occur between the ages of six months and three years with the average age being 18 months. The actual cause is unknown, although the condition appears to run in some (but not all) families. Around 1 in 4 children who are affected by febrile seizures will have a family history of the condition; however in half of all cases, there are no obvious causes or risk factors. Many parents worry that if their child will develop epilepsy when they get older. While it is true that children who have a history of febrile seizures may have an increased risk of developing epilepsy, it should be stressed that the risk increase is still quite small. What are the common causes of hypoxia?